As the world mourns the death of rapper Nipsey Hussle, more people are listening to his music: His sales and streams have increased since he died Sunday. Nielsen Music told The Associated Press that 2,000 copies of his albums were purchased the day he died, followed by 9,000 copies on Monday and 4,000 copies on Tuesday. That's in contrast to last Friday and Saturday when he sold just a few albums — an amount Nielsen Music said is too small to report. Typically following a death, a musician's albums sales will jump greatly. On Wednesday, Hussle's major-label debut album, 2018's "Victory Lap," was No. 1 on the iTunes albums chart, while his 2013 mixtape, "Crenshaw," was No. 5. Several of Hussle's songs, including "Racks In the Middle," ''Double Up" and "Grinding All My Life," have landed on the Spotify and iTunes' charts. By mid-afternoon on Wednesday, 10 of the Top 50 songs on Apple Music belonged to Hussle. Sales for Hussle's songs jumped from 1,000 to 14,000 on Sunday, Nielsen Music said. The next two days he sold 58,000 and 36,000 singles. 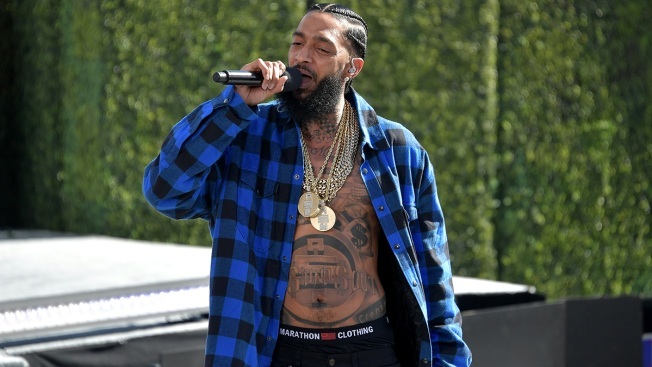 Hussle averaged close to 2 million audio streams before his death, but on Sunday he earned 10 million audio streams and 57 million on Monday. His video streams jumped from 900,000 to 9.7 million on the day he died. Hussle was just 33 when he was shot and killed in front of his South Los Angeles clothing store Sunday, not far from where the rapper grew up. After a nearly 48-hour manhunt, police arrested a man they say gunned down Hussle. The proud West Coast rapper began his career in the mixtape circuit, selling his albums from the truck of his car in Crenshaw. They were a success and helped him create a buzz and gain respect from rap purists and his peers. In 2010, he placed on hip-hop magazine XXL's "Freshman Class of 2010" — a coveted list for up-and-coming hip-hop acts — alongside J. Cole, Big Sean, Wiz Khalifa and others. Jay-Z even bought 100 copies of Hussle's "Crenshaw" for $100 each in 2013, and sent him a $10,000 check. But Hussle, once signed to Sony's Epic Records, hit a new peak with "Victory Lap," his critically acclaimed major-label debut album on Atlantic Records that made several best-of lists last year, from Billboard magazine to Complex. At this year's Grammy Awards, "Victory Lap" was one of five nominees for best rap album in a year that saw hip-hop dominate the pop charts and streaming services, and debates ensued about which rap albums would get nominated since a number of top stars released projects, including Drake, Eminem, Kanye West, Nas, J. Cole, Nicki Minaj, Lil Wayne, Migos and DJ Khaled. Cardi B's "Invasion of Privacy" won the honor in February, while the other nominees alongside Hussle were Travis Scott, Pusha T and Mac Miller. "Victory Lap" has sold 328,000 units based on sales and streams since its February 2018 release. It debuted at No. 4 on Billboard's 200 albums charts and featured collaborations with Kendrick Lamar, Diddy, CeeLo Green and more.